On June 28, 2011 the Massachusetts Board of Elementary and Secondary Education adopted new regulations to guide the evaluation of all educators serving in positions requiring a license – teachers, principals, superintendents, and other administrators. The regulations are designed first and foremost to promote leaders’ and teachers’ growth and development. They place student learning at the center of the process by using multiple measures of student learning. This guide is intended for all educators including teachers, principals, and other administrators. Every educator will assess his/her own performance and propose one or more goals for improving his/her own practice. A formal process for reflection and self-assessment creates a new opportunity for educators to chart their own course for professional growth and development. Every educator, from teachers to administrators to the superintendent, will also consider their students’ needs using a variety of methods to assess student growth and propose one or more challenging goals for improving student learning. They will be able to monitor progress carefully and analyze the impact of their hard work. Every educator will be using a rubric that offers a detailed picture of practice at four levels of performance. A common rubric used across BPS sets the stage for both deep reflection and rich dialogue about practice that our profession seeks. Every educator will also be expected to consider team goals, a clear indication of the value the new process places on both collaboration and accountability. Every educator will compile and present evidence and conclusions about their performance and progress on their goals, ensuring that the educator’s voice is included in the process. This system is based on state regulations passed in June 2011 with which Boston is required to comply. Despite this being a requirement, however, we are hopeful that this new evaluation system can help us as teachers and administrators focus on a common definition of effective teaching and what it looks like across the city. All educators, including administrators, are also evaluated in this new system. Evaluators and central office staff will be held accountable for this work. We are all in this together. BPS is committed to ensuring that all evaluators/principals are well-trained, and that those being evaluated understand the process. The evaluation provides a great opportunity for BPS central office and school leaders to target professional development resources toward areas of need. As a result, we can provide better support for teacher professional growth. In 2013-2014 educators will be required to use MCAS, if applicable. However, standardized test scores will be just one part of the multiple measures folded into the evaluation process. Your evaluation ratings will not be published publically as has happened in other states and districts. Under Massachusetts regulation 603 CMR 35.00, evaluation data is considered personnel information and will not be subject to disclosure under the public records law. The way you know evaluation as “forms” and a “paper-based system” is no longer accurate. The new system is a conversation between evaluator and educator, a process that engages teachers. Each step in the process is managed through and captured by the online system. 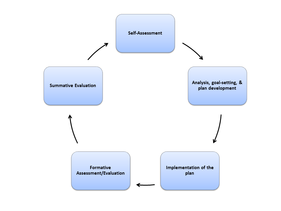 This evaluation process improves on the former system in many ways: the rubric will help us develop a common understanding of effective teaching, the online system will prevent paper copies of evaluations from being lost, and the continuous cycle will create more opportunities for communication and reflection on practice. School leaders can leverage the implementation of the evaluation system to improve the work in their school. An emphasis on improving teacher effectiveness can also focus work in the district’s three other priority areas – data-informed decision making, implementing the MA curriculum frameworks, and differentiation of instruction. By analyzing data that will be available when teachers’ evaluations are entered into the online system, schools will be better able to organize support for teachers – this will allow for teachers be supported in a better way. The FAQ contains answers to frequently asked questions collected at trainings and workshops up to August 2012. You may also download it via the link below.